Bernard and Bonnie Krupinski owned restaurants and real estate. He was a builder to the celebrity set. Among East Hampton’s social, celebrity and political set, it was hard to miss Bernard Krupinski and his wife, Bonnie Krupinski. Bernard Krupinski, known as Ben, was an East Hampton native and builder to the stars — among them, home decor mogul Martha Stewart and performer Billy Joel. She was a developer and a businesswoman. The couple, both 70, were among the four people on a small plane that crashed Saturday afternoon in the ocean about two miles south of Indian Wells Beach in Amagansett, authorities said. The couple’s grandson William Maerov, 22, and the pilot Jon Dollard, 47, were also aboard, officials said. The couple’s influence was far-reaching, from board positions to a range of social and political contacts, and among their many friends. In a 1992 article, The New York Times referred to Bernard Krupinski as an “ace East Hampton pilot and Contractor to the Stars.” Bernard Krupinski had completed key projects including the Parrish Art Museum in Southampton with his firm, Ben Krupinski Builder. In his spare time, he was an avid pilot who had owned several planes, according to the Federal Aviation Administration. Krupinski told The New York Times that his craft of choice was a Piper PA-31 Navajo, the same type of plane that crashed Saturday. Devastating news re Ben & Bonnie Krupinski, William Maerov & Jon Dollard in yday’s plane crash off LI. I knew Ben & Bonnie well; larger than life couple everyone knew, loved & respected. So many adored them, their vision, love of flying, entrepreneurship & devotion to LI. RIP. Krupinski owned three local restaurants “and there were a ton of homes he was building,” said Andy Sabin, an East Hampton Town resident. The flag outside Moby’s restaurant at the East Hampton Point marina complex,which is owned by Krupinski, was flown at half-staff Sunday in a gesture workers said was to honor Krupinski. 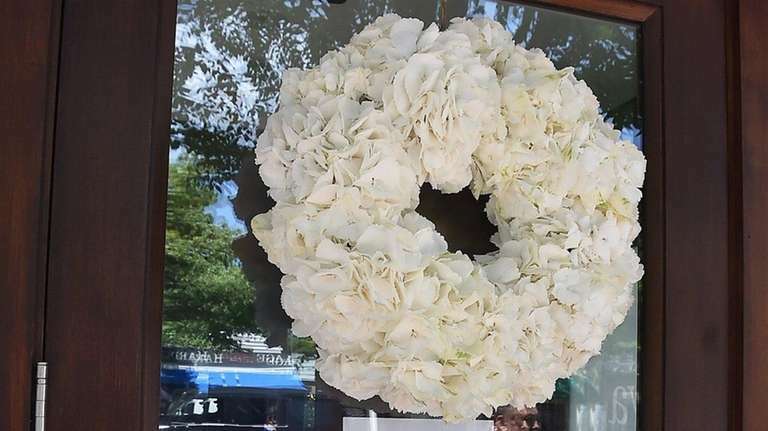 A wreath of white flowers hung on the door of Cittanuova, another of his restaurants, in downtown East Hampton Village. A sign on the door notified patrons that the eatery was closed Sunday. Staff at Krupinski’s third restaurant, 1770 House, on Main Street in the village, did not want to comment. “It’s a terrible loss for the community, said Will Falcheck, general manager of the East Hampton Grill, who was riding a bike near the search command post Sunday. Former Town Supervisor Larry Cantwell cited the couple’s philanthropy and assistance in restoring several historic buildings in town, including the Fowler House and the Amagansett Lifesaving Station. Arthur Malman, an attorney who served with Bonnie Krupinski on the East Hampton Town Finance and Budget Advisory Committee as well as the Airport Management Advisory Committee, said she would put community interests above her own. “The thing that stood out for me is that she would come up with things that hurt her and Ben’s business economically, but would benefit the community,” he said, citing her openness to instituting flight restrictions at the town airport to reduce noise. Bonnie Krupinski, whose maiden name is Bistrian, is a member of the founding family of the East Hampton Golf Club. The Bistrian family owns a number of businesses and developments in East Hampton. The Krupinskis were deeply involved in local Republican politics, those who knew them said. They also made donations to the campaigns of Rep. Lee Zeldin, Mitt Romney and Jeb Bush. Amos Goodman, East Hampton Town’s GOP chairman, said he first met the couple in 2015, when he was running for the Suffolk County Legislature. 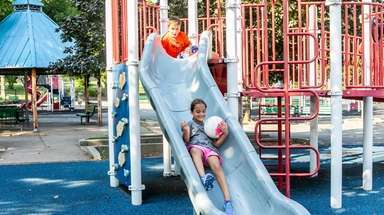 This story was reported by Vera Chinese, Lisa Irizarry, David M. Schwartz, Laura Blasey, Rachelle Blidner, Mark Morales, Tory N. Parrish, and Jean-Paul Salamanca. Jon Kenneth Dollard Jr. was a waiter at Oakland’s Restaurant and Marina in the early 1990s before he became a pilot, co-owner Christine Oakland Hill said Sunday, and became a regular at the family’s restaurants. Dollard, 47, was piloting a small plane that crashed into the ocean Saturday with three passengers aboard. A week or two ago, Dollard came to Sundays on the Bay in Hampton Bays for lunch after flying, and spoke of his time there to Oakland Hill and her mother, Joyce Oakland. “He said, ‘Mrs. Oakland, do you know your husband would let us go across to the ocean to go surfing when it was slow?’ ” she said. 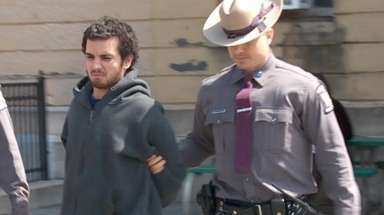 Dollard Jr. grew up in Shoreham, the oldest of four boys, his father, Ken Dollard said Sunday. He graduated with a bachelor of arts degree in political science from Salisbury State University in Maryland and then attended flight school in Florida. His son was “an extremely competent pilot,” said Dollard, a retired Federal Aviation Administration air traffic controller. 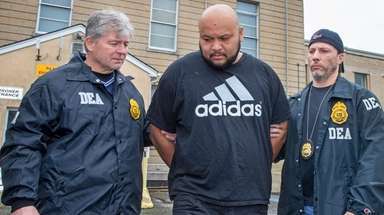 Dollard Jr. flew exclusively for Bernard and Bonnie Krupinski and had a “great friendship and respect with his boss,” his father said. The Krupinskis and their grandson William Maerov were also on the plane when it crashed. Officials: Search suspended for 2 after plane crashRescue workers did not find the two people still missing from the crash of a twin-engine plane in the waters off Amagansett and suspended the search because of "deteriorating sea conditions," police said. Experts: Storms and small planes a dangerous mixThunderstorms are "one of the most serious if not the most serious weather hazard" for pilots, an aviation expert said.